The shaped and engraved silvered-brass barometer register plates have divisions in Imperial inches on the left in combination with a ’36 scale’ derived from it and divisions in Rhineland inches on the right. Also on the right is a setting hand, which is operated by an integral knob. 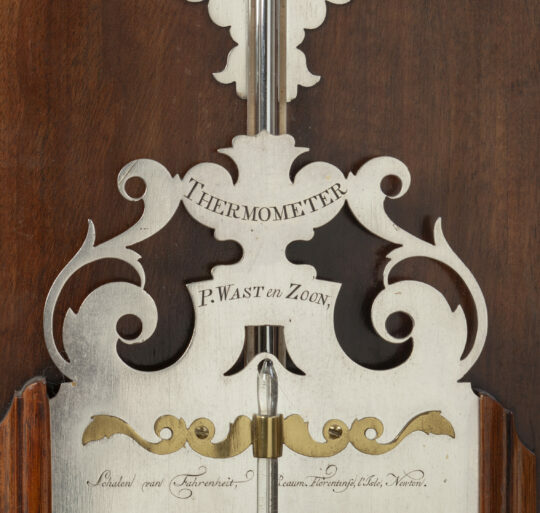 The maker has signed the instrument at the bottom of the barometer register plates in the following manner: P. WAST en ZOON Fecit Amsteldam. The thermometer scale is situated in front of the Torricelli tube and indicates the temperature amongst others in degrees Fahrenheit, Reaumur, Florentinse, l’Isle and Newton. 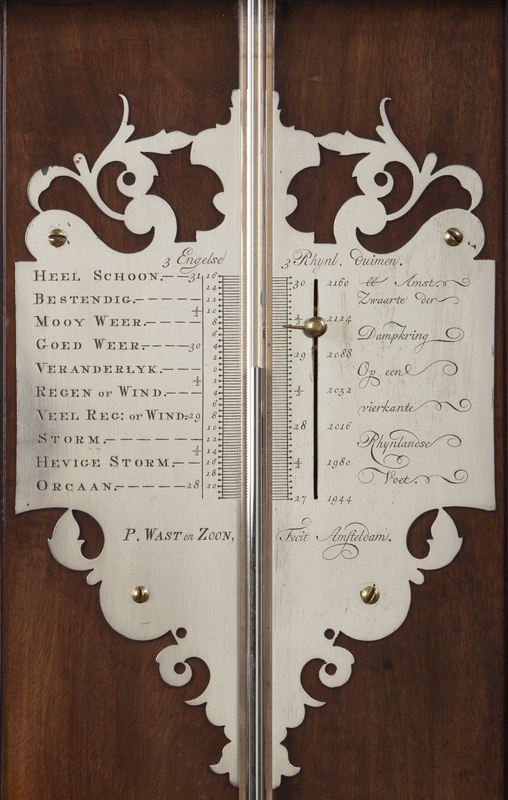 On the right several locations and dates are engraved, which indicate record temperatures measured at the time, such as Paris 1743 (+99), Amst. 27 July 1750 (+95), Batavia 17 jan 1753 (+78) at the top and below Upsal 1740 (-11) and Greitz 1759 (-28). The maker has also signed the thermometer: THERMOMETER P. WAST en ZOON at the top and below Fecit Amsterdam. The walnut-veneered oak case has a moulded broken architectural top with a turned vase-shaped finial on a base in the middle. The reservoir cover has a turned tube protector on the top and two turned drop finials at the bottom. Bert Bolle, Barometers in Beeld, Lochem, 1983, Figs. 122, 123, 127 and p. 237, footnote 129. Paulus Wast (Bern 1721 – Amsterdam 1784), was born as Paolo Quasti in Bern in 1721. In 1741, he settled in Amsterdam as an apprentice to Frans Primavesi in the Dijkstraat. On 24 May 1744, he married Anna Catherina Bregers in the Oude Kerk. They had two sons, Paulus (born 1745) and Pieter (born 1752). Roundabout 1750 Paulus must have started his own business and around the same time he probably changed his name judging from the signatures he used on his barometers. On 21 November 1758, he placed an advertisement in the Amsterdamsche Courant: Paulus Wast, woond t’ Amsterdam op de hoek van de Nes en de Langenbrugsteeg, in ‘de Gekroonde Baromeeter’, maakt, verkoopt en repareert alle zoorten van Weerglazen, ‘t zij Baromeeters of Termomeeters, tot allerley gebruiken, als ook tot Broeybakken, alles volgens de accuaatste schaalen; recommandeerde een ieder, zig te wagten voor zulke persoonen, die zig uitgeven voor of van hem te komen, en verzoekt een ieders gunst. From 1760 onwards Paulus the younger assisted his father and from that date the signature Paulus Wast en Zoon te Amsterdam appears. His son Pieter entered the business around 1775-1780. On 8 September 1784 Paulus Wast was buried in the Oude Kerk in Amsterdam Zoon. The company was continued until circa 1814.